This week a new fossil has made it to its forever home in the Burke Museum of Washington State. The fossil, the remains of a Tyrannosaurus rex, includes a very complete skull, some vertebrae, ribs, hips, and parts of the lower jaw. Even though there is not yet a scientific article that describes this fossil in detail, I wanted to talk a little bit about it here. Tyrannosaurus rex is one of the most popular dinosaurs out there. And what’s not to love? It’s got a giant head, and tiny arms, lived at the end of the Mesozoic in the western USA, and was a carnivore. Even though it is so popular, we do not have that many fossil specimens. Complete skulls are super rare. So this new Burke Museum find is a true gem. The excavation of the skull. Photo by D. DeMar. The fossil was found in the Hell Creek Formation of Montana this summer (2016) by 2 volunteers. The fossil, nicknamed the “Tufts-Love Rex” after the 2 discoverers, took 45 volunteers over a month to excavate. 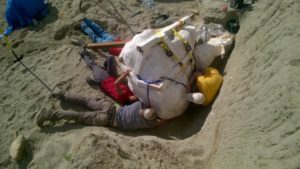 The skull is over 4 feet long and weighs 2,500 pounds (1133 kilos), mostly because of the rock surrounding the fossil inside the protective plaster jacket. The skull arriving at the Burke Museum. Photo by G. Hindsley (Seattle PI). 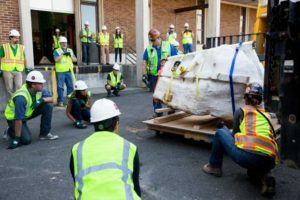 This week, the fossil made it safely to the Burke Museum, where preparators will remove the rock from the fossil and probably put it on display. This find shows how important it is to continue to search for fossils (we still have so much to find!) and that as long as you’re in the right place, *you* can find fossils, too! Look for local opportunities to join a field expedition and help paleontologists find new specimens!